Last year I had the great opportunity to showcase my writing and contribute to Fashion News Live. As a lover of all things style, wardrobe and glam it was an honor to lend my thoughts to such a great site. Now that the weather is getting colder I’d thought I would “throw it back” and give some sweater weather examples. Check out the article HERE and below! Whether you’re already starting to feel the fall chill or waiting for some sort of cool down like us Californians, there’s plenty of sweater inspired outfits that I’m ready to start wearing. Layering in Southern California is pretty minimal compared to the snowy parts of the rest of the world but that’s no excuse for us not to get in on the sweater fun! I’m here to give you some fashionable and simple outfit ideas that can give you a head start into the new season. Starting off with a classic combo, a simple horizontal over-sized sweater can be paired with some liquid leggings to give it a more edgy look. A nice round wool scarf in a neutral color doesn’t make the outfit look over the top. Pair it with some tan thick heeled booties and there’s an outfit for day and night. The second outfit might be for those who are still having some sunshine in their life. A pair of bright colored shorts with a black and white sweater can be the perfect everyday fit. As the nights get cooler, adding some black knee high socks can be the finishing touch. My other favorite pairing would be a maxi skirt and a sweater. The sparkles woven into this sweater are not too much as they are on a neutral surface and contrast with the dark bottoms. Adding a simple long necklace can play up the outfit and keep you from looking frumpy. Not super into accessories? That’s ok because detailed collars are all the rage right now. Get a simple oversized sweater and pair it with a collared shirt. Your specific choice on the detailing of the collar can make your whole outfit. Like the one shown below! I decided to keep the attention on the sequined collar by pairing it with black skinny jeans and boots. Earth toned tribal prints can scream fall! The thicker material on the dress below keeps you warmer. Dress? Yes, short body hugging dresses can be worn in the colder seasons by adding thick tights and scarfs. I’m a big fan of just folding some of the material under and wearing it as a shirt. Layering a nice jean shirt or coat can help you create new outfit ideas without needing to go out and purchase new clothes. Now that you’ve seen some of my fall inspired outfits, what are your must have fall choices? OK could today get any better right now? New music by Eminem and one word to describe it…OBSESSED! 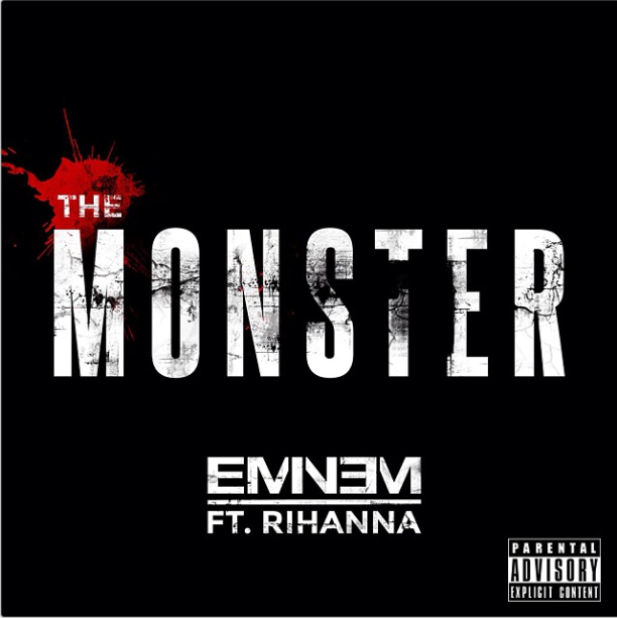 “The Monster” featuring Rihanna is out of this world! I just heard it and I need you all to listen to it. Go ahead, click on the below for the amazing new song or go HERE. Eminem does it again with Rihanna and music magic is made, I can’t stop listening to it. Tell me you love it as much as I do? 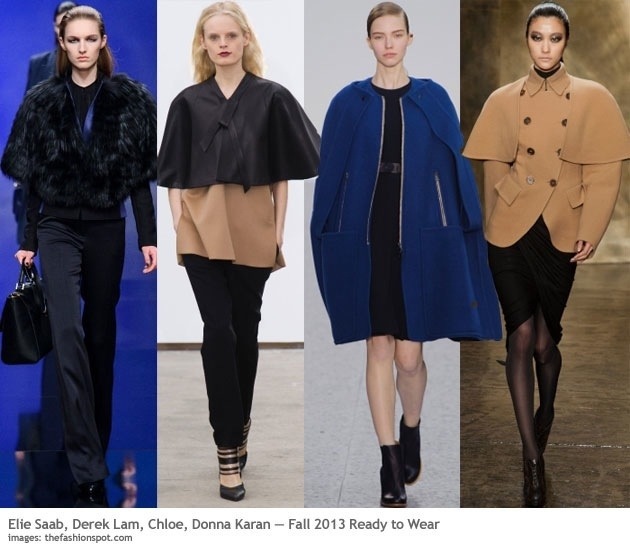 It’s never too late to dish on some major fashion trends. This time I’m here to report on one comfy and uberstylish must-have that I’ve added to my wardrobe. Trousers! 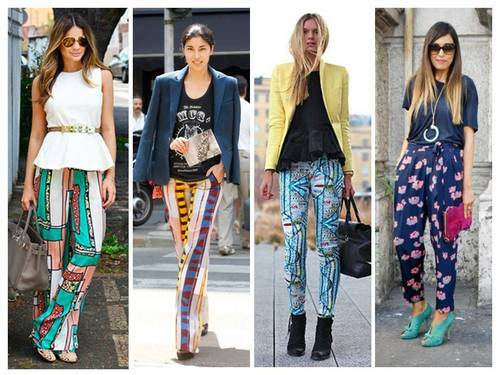 And not just any, but printed trousers. Whether they’re wide leg, fitted, or skinny I can’t get enough of them. Adding them to your closet will help you in many ways, here’s how! First they are comfortable, who doesn’t like a little comfort? Secondly, they are fashionable and can enhance your outfit tremendously when done right, something that plain black or grey trousers fail to do. Thirdly, you can wear flats, sandals, heels or wedges and still make it look like you tried to dress up even when you didn’t. Lastly, they are available anywhere! From affordable Forever21 designs to designer made, they are so easy to find. I found my favorite pair for only $20 at the mall. 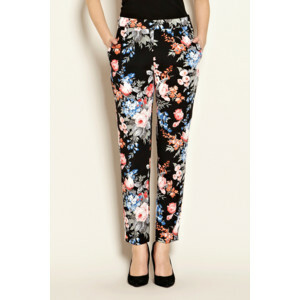 What I love about them is the fact that a simple basic top can be paired with the printed pant. A blazer, leather jacket or coat can enhance your look by making it casual or dressy. I recommend grabbing a great multicolored pair and adding a colorful blazer like the outfit above with the yellow one. You don’t have to go all out. If you are new to wearing this much print keep your accessories to a minimum until you find the perfect pair that makes you feel superb and then try dazzling it up a bit. The great part about these pants are that they are the statement. 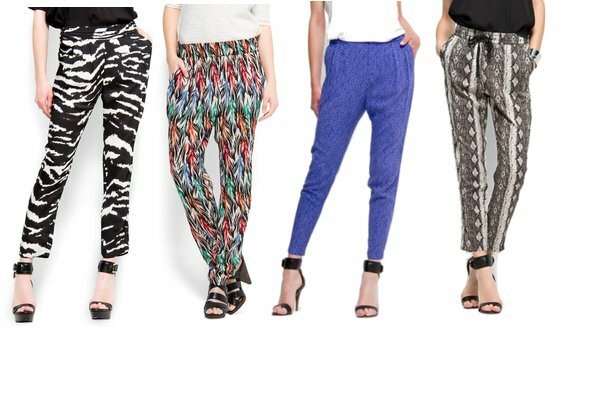 There literally are thousand of prints, colors, designs and styles that finding the perfect ones won’t be difficult. Unless you fall in love with all of them and end up wanting multiple pairs! But who cares these trousers are timeless. Wear them at the office, school, work, church, a date, a concert, you can be seen in them anywhere and look like you stepped out of a fashion magazine. 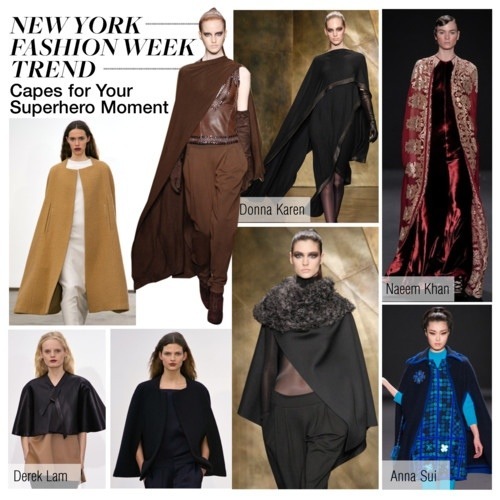 Try it out and let me know how you style this awesome trend. 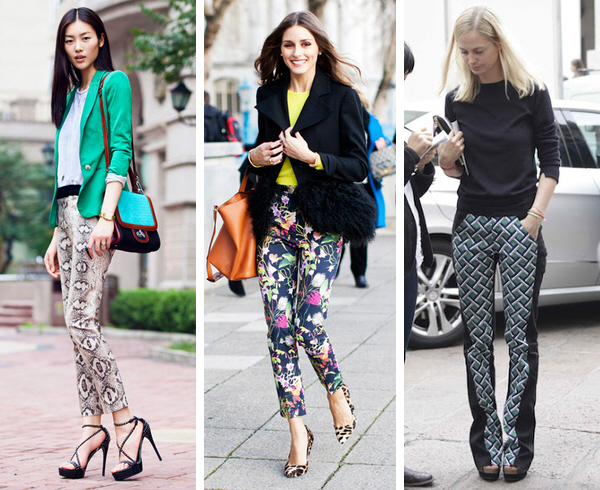 Are you a bright colored chica, basic black and white, floral print, animal print or all of the above lover? As for me I’m a must-have-all! Every time I pull them out I wear it with something different. If I have a black and white pair I’ll sometimes throw on a basic black top and add a chunky statement necklace, high pony and depending on the outing heels or sandals. Never the same look twice!